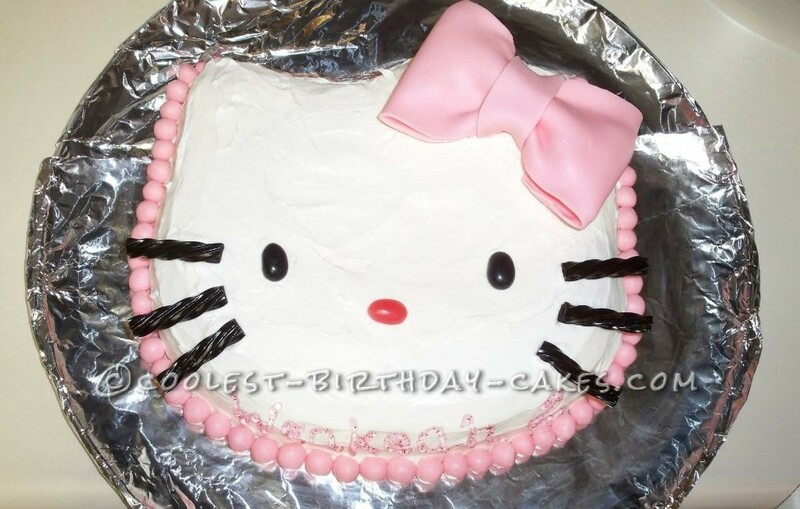 I made this Hello Kitty birthday cake for my daughter’s 2nd birthday. I used strawberry cake mix and baked it in a Hello Kitty pan you can purchase in several stores. I used white frosting to cover. The nose and eyes are jelly beans. The bow is made of marshmallow fondant I made a day before with a little bit of red food coloring to color it pink. When I formed the bow I put some paper towel inside the bow to stabilize and preventing it from coincide. Then I left it to dry. The whiskers are licorice Twizzlers. At the end I used the marshmallow fondant leftovers and formed little balls and decorated around the cake. With a food glitter-gel I wrote her name and age at the bottom on the side. Done! Not too difficult to do I find. My little girl loved and was all exited about her birthday cake.